Other participants can be found here. I'm guessing it could be a birdbath, considering all the lush vegetation. Looks very tropical. The first picture is also a bit surreal, with the sink peeking out among the lush vegetation. I like your pictures. Is it an abandoned or old garden? Happy WW. Always a pleasure to find a good photo blog. I do not think this is a abandoned basin. Your pictures left many question marks behind. 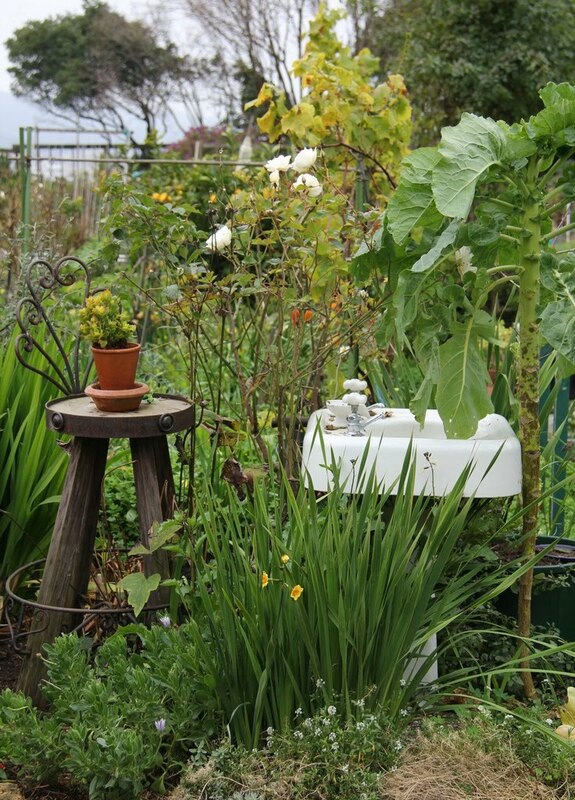 A sink in a garden can be useful and makes watering and cleaning garden vegetables easy. Interesting picture. Does it actually work or is more of an ornamental thing? It IS interesting photo but it somehow fits to the garden! Thanks for sharing and commenting on my blog. Neat looking yard art! Great capture. What a fascinating treasure Karen. A perfect wordless choice. Sukhmandir Kaur: Good idea, I didn't consider it being a bird bath. Con Artist: It is a community garden so I guess anyone can work on it. Definitely not abandoned as far as I could tell. Layla: Thanks for your compliment! Rainfield61: I received no answers to your questions. Don't let a good sink go to waste. Life Ramblings: I don't think it's operational; although, it was covered by so much vegetation, it was hard to tell where were the pipes. William: I think it's just there as a decoration. Odd, but interesting. Louis: The unusual part is the sink was very clean. Yoshi: Every garden should have a sink. amandab: It's a good conversation piece if it no longer functions. eileen: It definitely stands out amongst the greenery. Stevebethere: Thanks! It's lonely because it's the only sink there, but it's surrounded by nature. Lina: I don't think it works and if it does, it's hard to get to with all the vegetation. Photowannabe: Thanks! Nice way to recycle a used appliance. I must say, an odd place for a sink, but a charming old sink! And a beautiful photo!